We all enjoy flowers, whether in a vase in our house or in our gardens. We enjoy the multitude of bright colors and the fragrant odor they give us. But there can be a dangerous aspect to some of our favorite plants. The list of poisonous plants is very long, but this will give you information about some of the more common flowers and ornamental plants. Lilies are common as cut flowers and in landscaping. They are toxic to cats, but fortunately not to dogs or horses. All parts of the plant can cause kidney problems. A cat that walks through a garden of lilies, then ingests the pollen as it grooms its fur, can develop severe kidney problems. Azaleas are toxic to dogs, cats, and horses. Symptoms include vomiting, diarrhea, drooling, mental dullness, cardiovascular depression, collapse, and death. Even eating a few leaves can cause serious problems. 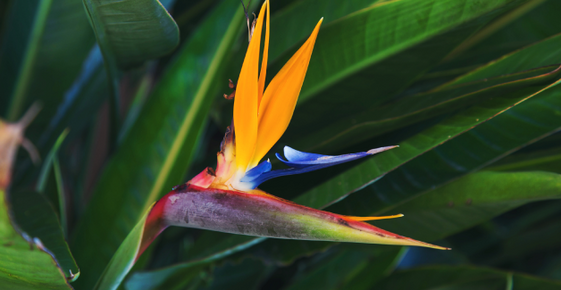 Bird of Paradise is among one of the most beautiful flowers, but it can be toxic to cats, dogs, and horses. The fruits and seeds can cause vomiting and drowsiness. Begonias, especially the tubers, are toxic to dogs and cats. They can cause oral irritation. This can progress to swelling of the mouth, lips, and tongue, causing drooling, vomiting, and difficulty swallowing. All parts of the castor bean plant are toxic, but the seeds contain the highest concentration of ricin, one of the most poisonous compounds known. This affects horses, cats, and dogs. Symptoms are mouth irritation, vomiting, diarrhea, kidney failure, seizures, and death. Signs usually start 12 to 48 hours after ingestion. Chrysanthemums are toxic to horses, dogs, and cats. They can cause vomiting, diarrhea, drooling, weakness, inability to walk properly, and even skin problems. Hibiscus can cause a loss of appetite, vomiting, and diarrhea in cats, dogs, or horses that ingest it. Oleander is very toxic to dogs, cats, and horses. It has toxins that can cause a low heart rate, heart failure, and death. It is possible to also see vomiting and diarrhea. There are several ornamental plants that contain cardiac glycosides. Plants such as clematis and foxglove can affect dogs, cats and horses to cause weakness, heart failure, drooling, and death. There are hundreds of other plants that can be toxic. For more information on any toxic plants, consult with your veterinarian. Simple precautions can keep your pets safe and healthy.